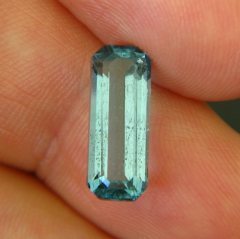 Comment: As deep blue as it gets in unheated aquamarine though hard to catch on photo. See the backside image where the colour is accumulated lengths-wise, there it moves almost into a sapphire sky-blue. Unfortunately the rough did not allow a closed centre, thus we see a long window throughout the middle of the stone. In its symmetry this window seems not as disturbing as some but it is very helpful on the budget. 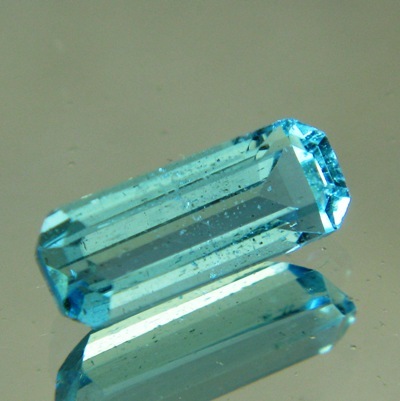 Exceptional deep tone for an aquamarine with MD60. Famous pedigree for beryls. No treatments, DSEF certified, no visible inclusions (only under the lens and on our tell-all images). Bargain for a full-sized pendant gem.